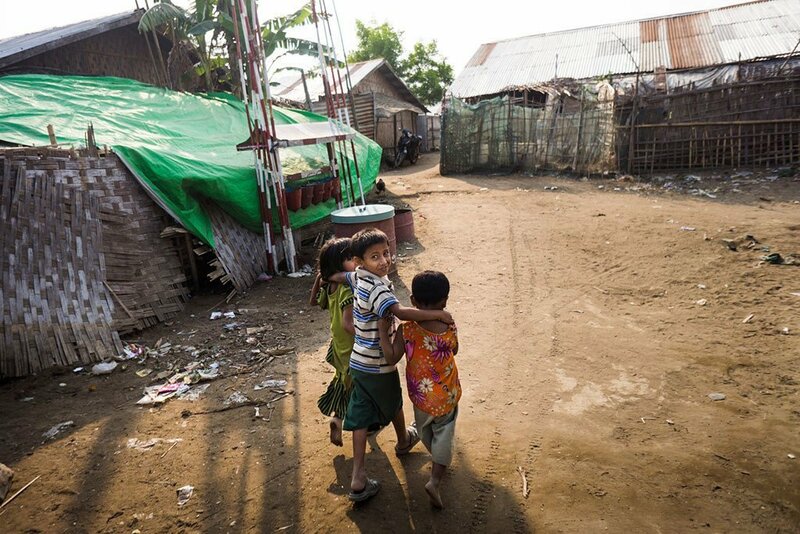 UNICEF/Brown In this file photograph, children walk shelters at a camp for displaced persons in Rakhine state, Myanmar. Most of the displaced are women and children. Since late August 2017, more than 725,000 mainly-Muslim Rohingya have fled Rakhine state, across the border into southern Bangladesh, fleeing widespread and systematic ethnic violence. The “small-scale quick impact projects” were designed in consultation with affected communities and aim to improve livelihoods, build trust and promote social-cohesion among the various communities. In a statement, the two UN agencies also said that they “remain strongly committed” to implementing the tripartite memorandum of understanding with Myanmar authorities, signed in June, to support the creation of conditions for the voluntary, safe, dignified, and sustainable returns of the Rohingya refugees from Bangladesh. With security the primary concern, senior UN officials have cautioned against forceful return of refugees. Refugees have also voiced concerns for their safety and well-being, and Rohingya communities in Myanmar remain vulnerable, facing restrictions on their freedom of movement and limited access to essential services. The project approvals coincided with a visit to the country, of UNDP Regional Director for Asia and the Pacific, Haoliang Xu, and UNHCR Deputy Regional Director, Bernard Doyle. During their five-day visit, through to 14 December, the senior UN officials visited Rakhine, including the provincial capital Sittwe, and various villages where the two UN agencies have conducted initial rapid-needs assessments. They also talked to communities on the ground about the challenges they face, and prospects for the future. The delegation also met State Counsellor, Daw Aung San Suu Kyi, and key Government Ministers, together with provincial and local officials.